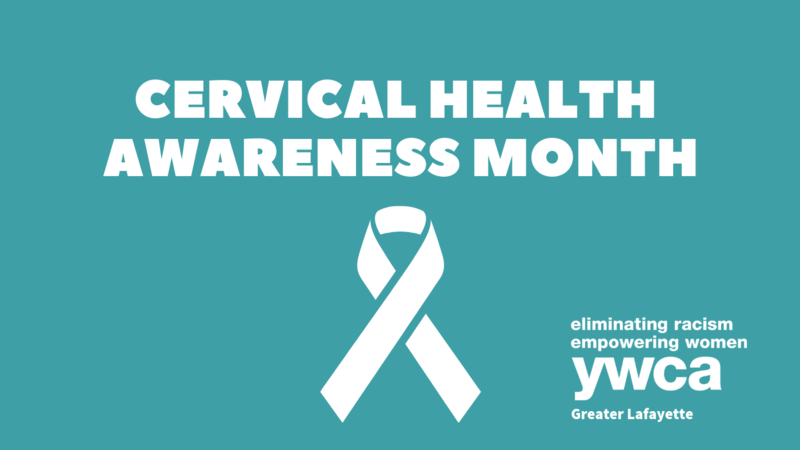 January is Cervical Health Awareness Month. Did you know that YWCA Greater Lafayette’s Women’s Cancer Program can help connect Indiana women with low or no-cost health screenings to detect cervical cancer? When you think of YWCA Greater Lafayette Women’s Cancer program, you probably think of a pink ribbon, breast cancer awareness, and scheduling your annual mammogram. Our Women’s Cancer Program works to combat breast AND cervical cancer through screenings, early detection, and treatment. According to the CDC, there were 12,845 new cases of cervical cancer reported in the United States in 2015, the latest year for which incidence data is available. Cervical cancer used to be the leading cause of death for women in the United States, but rates have declined steadily in the last 40 years in large part due to preventative measures like HPV vaccination and regular Pap tests. Cervical cancer is now one of the most preventable forms of cancer. You can protect your, or your child’s, cervical health through vaccination against human papillomavirus (HPV), STD testing to detect HPV, and regular screening to detect changes in the cervix that can lead to cervical cancer. Vaccination against HPV is available for individuals between the ages of 11-45. The vaccine is most effective and produces the strongest immune response against HPV when administered in the preteen years, between the ages of 11-12. The HPV vaccine helps prevent infections from the types of HPV that cause genital warts and cervical cancer. Contact your primary care doctor to discuss your options and see if the HPV is a good choice for you. If you are uninsured or under-insured, community health centers such as Riggs Community Health Center and Planned Parenthood may be able to assist you. By the age of 21, you should start getting Pap tests. A Pap test detects changes in the cervix caused by HPV. Provided your initial results are normal, your doctor may recommend that you wait three years before your next Pap. If you have a Pap test done in conjunction with an HPV test and both return with normal results your doctor may recommend waiting five years before your next Pap test is due. Your primary care or OBGYN doctor can administer a Pap test and perform an HPV test during your annual preventative care appointment at no cost to you under most insurance plans. If your Pap test results are abnormal, there are several additional tests that can determine next steps. These tests include colposcopy and cervical biopsy, endocervical curettage, cone biopsy, and LEEP (Loop Electro-Surgical Excision Procedure). If you are uninsured, or under-insured with an insurance that will not cover the complete cost, YWCA Greater Lafayette’s Women’s Cancer Program can help. In 2018, YWCA Greater Lafayette’s Women’s Cancer Program funded 693 Pap tests, 55 colposcopies, 15 gynecological consultations, and 5 LEEPs. At YWCA Greater Lafayette, we believe that financial means should never be a barrier to preventative health care and early detection. Call our Women’s Cancer Program at 765-742-4375 today to see if you qualify. Visit the Women’s Cancer Program section of our website to learn more about the program. YWCA Greater Lafayette’s Women’s Cancer Program is made possible by funding from the Indiana State Department of Health Breast and Cervical Cancer Program, Susan G. Komen for the Cure Central Indiana, the Indiana Breast Cancer Awareness Trust, private donations, and fundraisers.